The Romance and Nostalgia of days gone by. We have seen so much interest in the 1920’s, 1940’s, 1950’s and 1970’s this season. Stills, TV Commercials, feature films. You’ll find it informing furniture design, Clothing, interiors, architecture and of course advertising.Everyone seems to be looking toward bygone eras for inspiration. There is nothing new in this of course but this season it seems to be intensified as if we are looking back at a simpler, less complicated lifestyle where life doesn’t move at a million beats a second. Shoot My House have made it our mission to go in search of such locations in the form of both homes, gardens, stores and public spaces as well as moving locations which we will be launching very soon. 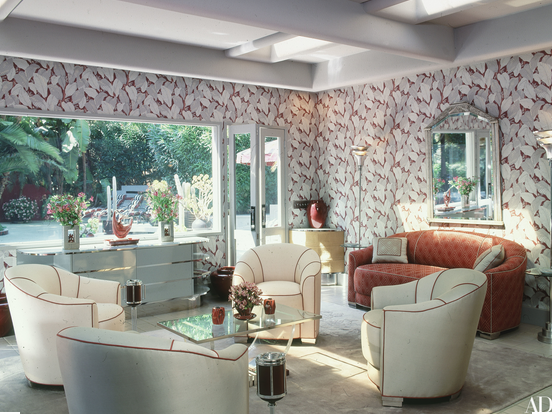 in the meanwhile and in line with this nostalgia for all things vintage I thought I’d share this wonderful article on Barbara Streisand’s Malibu guest house with you. A long time fan of all things Barbara – I’ve always admired her style and her absolute insistence that everything is exactly as she wants it to be. There is no room for can’t, too hard, impossible with this lady. She is exacting and she tackles everything in her life with the same fierce determination and insistence on perfection. But that was then. Two Academy Awards, two Emmys, a special Tony, eleven Golden Globes, eight Grammys, thirty-seven gold albums, and twenty-one platinum albums (including her latest, Back to Broadway) later, this singer-actress-writer-producer-director-composer can collect anything she wants. And she has amassed enough art, furniture and decorative arts to fill a New York apartment, a house in Beverly Hills, and a compound of five houses in Malibu. 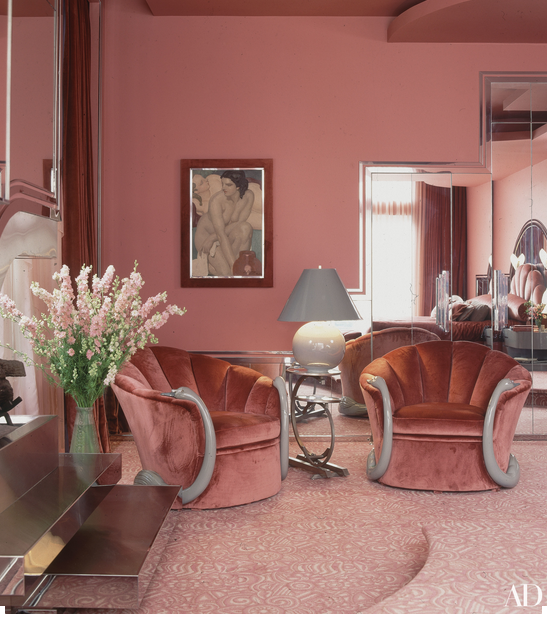 Such is the case with Streisand’s collection of Art Deco, which is to be auctioned in March at Christie’s in New York. The collection, which includes a good deal of Lalique glass, an inlaid-ivory desk by Emile-Jacques Ruhlmann, Tamara de Lempicka’s painting Adam et Eve, and clocks by Lalique, Cartier and Cheuret, has been lovingly showcased since the mid-1970s in a guesthouse/poolhouse on the Malibu property, which she meticulously remodeled in the Art Deco style, down to the doorknobs and drawer pulls. She even bought period cars—a 1926 Rolls-Royce and a 1933 Dodge—for its garage. So she studied the many books and portfolios that she had gathered on the period, such as Le Luminaire, a portfolio of lighting designs that was published to coincide with the watershed Exposition Internationale des Arts Décoratifs et Industriels Modernes, held in Paris in 1925. She pored over illustrations of decorative motifs, eventually designing several for the house’s architectural details—doors, friezes, and stair rails, ceramic tile patterns, rugs, and even a shower curtain in one of the baths. 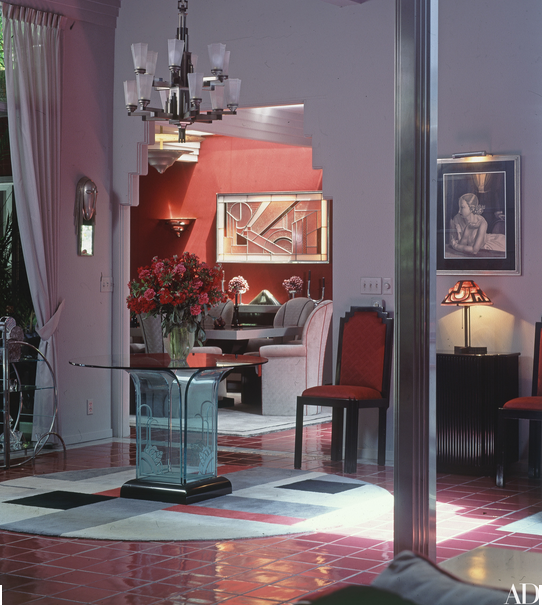 The living room fireplace is embellished with a Mondrian-like arrangement of stainless-steel decorative panels that were part of the landmark Art Deco Richfield Building in downtown Los Angeles. The bedroom carpeting was copied from a 1930s Bigelow original that Streisand recalled seeing in the Huntington Hotel in San Francisco. Where original furnishings weren’t used, she had reproductions or interpretations made. Another area in which Streisand set strict limits for herself was that of color. Unable to decide between gray and burgundy for the house’s exterior, she used both—the house is gray on two sides, burgundy on two sides. These colors formed the basis for the interiors, which consist of only two color ranges: black to gray, and burgundy to pale rose. 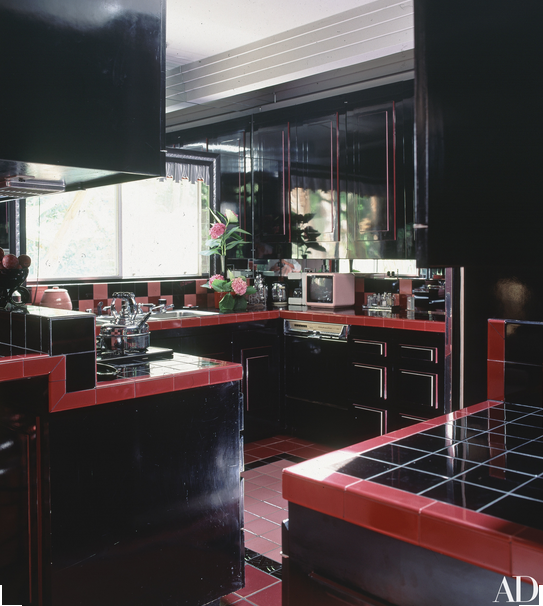 Each room in the house is decorated in a different combination of these two spectrums, and no deviation is allowed: “I don’t put a black vase in the gray-and-burgundy room,” says Streisand. Nor does she put burgundy flowers in the rose bed-room, or pink flowers in the burgundy-and-gray living room. Even the wrappers on the candy in the candy dishes are color-coordinated. Streisand doesn’t find this narrow range of colors at all confining; in fact, she says, “I like monochromatic rooms, and I like black-and-white movies.” The family photos atop the piano in the living room are black and white—color photos would disturb the harmony. “I like to wear one color; I never wear prints,” Streisand continues. 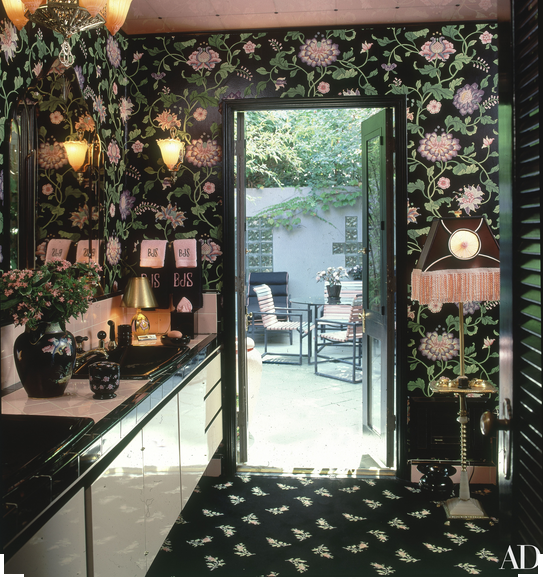 “I think a person sort of fades away in prints.” Still, that didn’t stop her from doing a couple of rooms in prints. 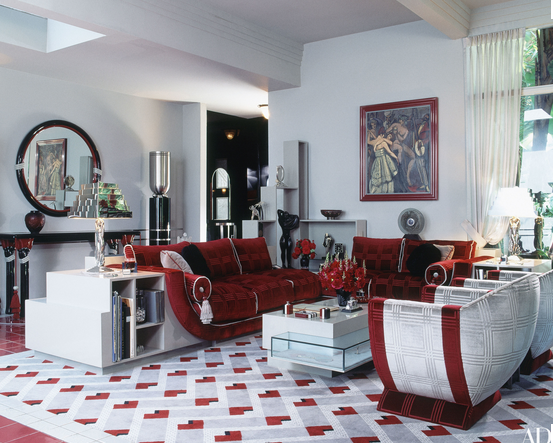 She calls the study off the living room her ‘Art Deco Matisse room,” in deference to the artist who so magically juxtaposed pattern on pattern in his paintings. In the room is a Deco sideboard that a previous owner had left out in the rain. Streisand rescued and restored it, and when she decided to use it as a stereo cabinet, she had a pair of speaker cases made. Their carving matches that of the sideboard exactly, and she takes pains to point out how beautifully they are made. But then craftsmanship is something that Streisand feels passionately about. The house, she says, took nearly five years to complete. “Doing this took me almost a year,” she sighs, pointing to one of a pair of elegant gray silk tassels that hang from the silk-rope handrail in the stairway. Craftsmanship is also the main reason she loves old things. “Where could you buy shoes like this?” she asks, reaching for a pair of 1920s pink satin evening slippers, part of the wardrobe of vintage clothing that fills the house’s closets (color-coordinated with each room, of course). But, as this tireless collector is fond of saying, “I like the idea of evolution and change.” Having focused on American Arts and Crafts furniture, folk art, Pairpoint lamps, and paintings by Thomas Hart Benton and Edward Hopper, Streisand now says, “This time I’m moving back in history—I’m fascinated by eighteenth-century America.” Between study trips to places like Winterthur and Monticello (which inspired her to repaint her Beverly Hills dining room a deep, rich ivory), Streisand is buying everything from primitive paintings and furniture to eighteenth-century American interpretations of Chippendale and Queen Anne.